Spyderco’s original Aqua Salt was an amazingly versatile, do-everything fixed-blade knife that was also 100% rustproof. Its legions of die-hard fans ranged from commercial fishermen all the way to military special operations personnel and they were all devastated when it was discontinued. Based on popular demand, the Aqua Salt is now back and better than ever thanks to the addition of a non-reflective titanium carbonitride (TiCN) blade coating. Like the original, it features a broad, hollow-ground blade crafted from H-1 steel—an extraordinary nitrogen-based alloy that is exceptionally tough and completely impervious to corrosion. 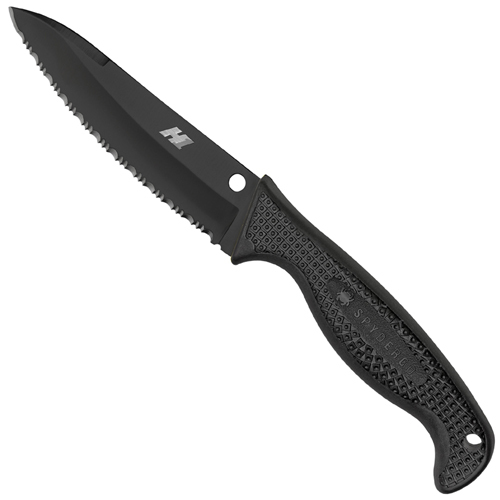 The blade’s deep hollow grind, drop-point profile, and full-thickness spine provide a superior combination of low-friction cutting performance, point utility, and structural strength. The handle of the Aqua Salt is made of durable fiberglass-reinforced-nylon (FRN) and is injection molded directly onto the substantial tang for strength. The handle’s Bi-Directional Texturing pattern provides a slip-free grip and ensures superior control, even with wet hands. To protect the knife when not in use and allow it to be conveniently carried, the Aqua Salt includes a matching injection-molded polymer sheath with a multi-position G-Clip attachment that supports belt or waistband carry. The sheath’s grommeted construction also allows it to be easily lashed or flex-tied to personal equipment. 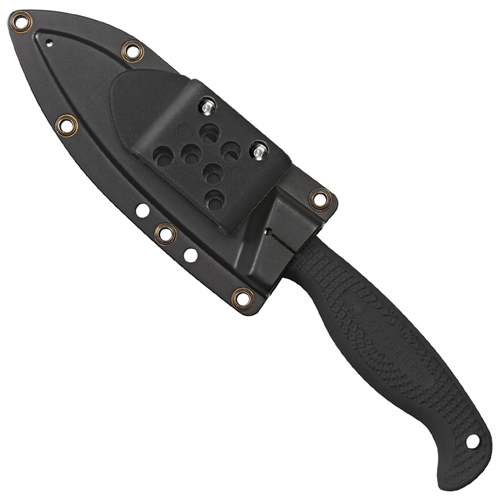 Available with a Plain Edge or fully serrated Spyder Edge cutting edge, the Aqua Salt is a truly exceptional cutting tool that is now optimized for tactical applications.